News (latest posting 05-Feb-2019) Feb 2019 newsletter posted - Yukon Jackson's visit! 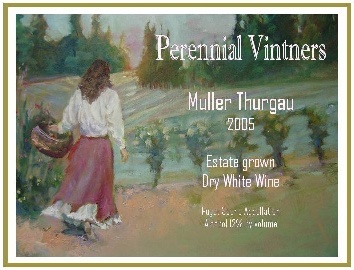 Perennial Vintners began in 1997, when Mike Lempriere decided to try making wine. Mike continued to make wine as a hobbyist through 2002 and garnered many successes, including several awards in the Puyallup Fair amateur competitions. Mike soon came to understand that 95% of winemaking is truly done in the vineyard, and that making his own wines was not enough -- it was necessary to live upon and manage the vineyard for the dream to be complete. In 2003 Mike and family moved to Bainbridge Island and began planting the vineyard. As of Summer 2005 PV is a bonded commercial vineyard and winery! The first commercial vintage was released in Mar-2007. Please visit our History page for a more detailed account. PV specializes in the delicate wines from the maritime-influenced cool climate viticulture of the Puget Sound AVA; we've pioneered the establishment of an underappreciated grape named Melon de Bourgogne (in France known as Muscadet) here in the Seattle, Washington state, U.S.A. area. PV is entirely Mike, so availability may be limited. I love to have tasting room visitors at most any time, if I can possibly be there to show you around and pour wine. Please click on "schedule/make appt" link in left bar even if only a few minutes away (call/txt) -- I may be able to accomodate you.